The story of an inter-galactic smuggler, drug dealer and soldier of fortune who keeps a very unusual pet. 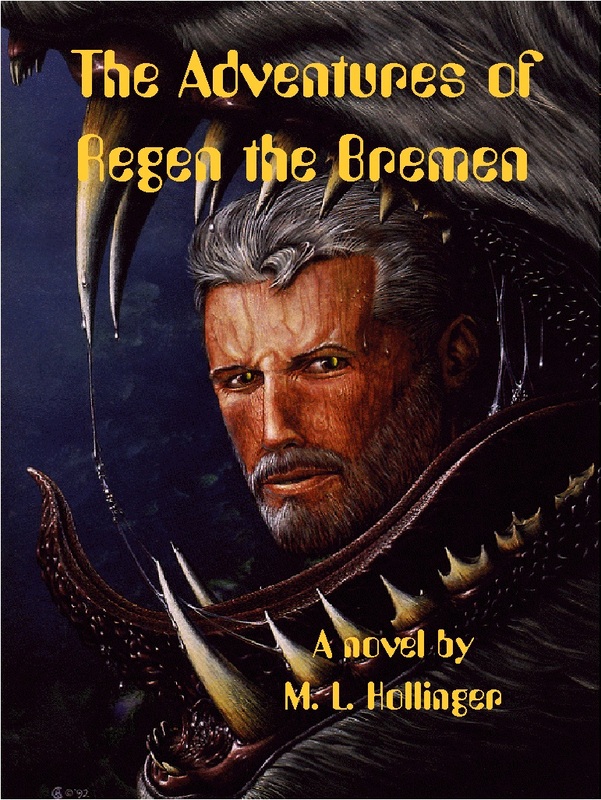 Regen is from the planet Brem, and Bremens have a reputation of being tough guys and great lovers. Regen finds himself in several tight spots and his pet skeen, Hitler, helps him out of each one. NOTE: I write under the pen name M. L. Hollinger. It was a skeen, and few there had ever seen a live one except in a very heavy steel cage. It ambled along on large, fur-covered hind legs with its rat-like tail tucked safely between them. The usually fearless patrons parted respectfully as the Bremen walked up to the bar. �You can have anything you want in here, but that thing has to stay outside.� The bartender nodded toward the skeen. The Bremen turned to the skeen and spoke almost lovingly. As if in response to the insult, the skeen jumped up on the bar and glared at the bartender with beady red eyes. It opened its mouth to reveal an array of stiletto-like teeth and sat back on its hind legs, front claws extended. A low, hissing sound came from somewhere deep inside its leathery chest. �Git down, Hitler.� In response to the Bremen�s command, the creature hopped back to its place near the big man�s feet and curled up into a ball. The bartender placed a dog-eared menu in front of the man and poured the whiskey out of a tall bottle. He was about to put the bottle back in the rack when the Bremen spoke. The Bremen perused the menu while he gulped down the bourbon then shoved the greasy paper across the bar. �Whatever you say, mister.� The bartender scribbled the order on a computer pad and left to serve other customers. Now that the confrontation was over, the bar returned to its previous condition of joyous chaos. The short, fat Aandie on his left was the first to comment on the skeen. �No problem.� The Aandie reached over to a nearby table and lifted a chunk of meat from the platter in front of a small Tumeg. The victim protested loudly in his shrill, whiney language, but made no move to stop the theft. �Here, Hitler, roll over!� the Aandie commanded as he held the morsel out in front of the skeen. The patrons near the animal watched enthralled as the hideous creature rolled over several times and sat up with its mouth open in anticipation of its treat. �That is remarkable!� The Aandie lowered his hand to the skeen. �Look out fer yer�� Regen didn�t get to finish his sentence. Hitler jumped to grab the meat and took two of the Andie�s fingers as a bonus. �Ahhhhgh! The damned thing bit me! Help somebody!� The Aandie screamed in pain as blood poured from the severed joints, and the victimized Tumeg giggled with glee. A security man rushed to the scene and applied a dressing to the wound. �Ever�body knows skeens like fingers better�n anything. You should�a been more careful.� Regen poured himself another glass of bourbon as the security guard rushed the Aandie to the door. Regen drew his pistol and stepped between the guard and Hitler. Luckily, the confrontation was interrupted by a woman in the uniform of the royal palace guard. The guard holstered his weapon and walked away grumbling. Regen studied the woman. She was almost as tall as he was, and her build, though slender, showed the lines of a powerful frame under the black jump suit. Her hair, nearly the color of the red piping on her uniform, was tied back in a bun, and she wore very little make-up. Emerald green eyes fixed the Bremen in a gaze combining admiration with official authority. She was every bit as beautiful as the last time he�d seen her. �I�ve got five men looking for you, Regen, but I thought I might find you in here,� she said. �It was easy. You�re a Bremen, Bremens like low places, and this is the lowest dive in Loba City. Besides, I don�t see anyone else in here with a pet skeen. I�m surprised someone hasn�t shot it by now.� She scowled at the skeen, and it scuttled behind Regen�s legs to lick up the Aandie�s blood. �Well, was it?� He smiled at her with an oily confidence in his sexual prowess. Regen placed the platter on the floor in front of Hitler who dove into it with gusto. Evidently, the Aandi�s fingers only served as an appetizer. �Want a smurger?� Regen asked Varda. Regen picked up a smurger and took a large bite. �Go ahead,� Regan said around his mouthful. �I been there, and I ain�t interested in goin� back.� Another bite of smurger replaced the first. �What�s �good�?� Regen asked. He knew the royal pay scale was not nearly as generous as that of the many smugglers and drug dealers in the bar. That motley group was keeping a watchful eye on the royal guardswoman. They thoroughly distrusted anyone wearing that uniform. Varda definitely had his attention now. He wiped his mouth on his sleeve and turned to face her. �What�s the job?� Regen asked. �Bringing back the Prince�s lost dog,� Varda answered. �Hitler ain�t finished his dinner yet, and I could use some more bourbon.� Regen signaled the bartender to bring another glass. �Have a drink and relax for a while.� He poured Varda a double shot and another for himself, then continued with his smurgers.